After years of planning and a little more than a year of construction, the 17,000 sq. ft. Salinas Municipal Aquatic Center has replaced its 1949 counterpart. The Salinas Aquatic Center has incorporated many “green” materials and processes, thus earning a Gold rating from the U.S. Green Building Council. The facility has a retractable overhead roof, significant natural lighting, lockers are built from recycled material, and timed lights are energy efficient. Just outside the aquatic center there are three bioswales: patches of compost and sand that filtrates pollution from rainwater before it travels to the ocean. The 25-meter by 25-yard swimming pool with 10 lap lanes has a one-meter diving board and competition starting blocks. The facility offers water aerobics, swim lessons, water polo, and lap, instructional and recreational swimming. The city is planning to remodel the aged existing natatorium, neighboring the newly completed indoor pool, to include an indoor recreation center and gymnasium. The aquatic center was funded by a combination of government and private money. The Packard Foundation donated nearly $1.5 million to the project, while $2 million came from the Salinas Community Pool Foundation. The Monterey County Aquatic Team also raised $2 million. An additional $2 million was obtained from federal and state government agencies. 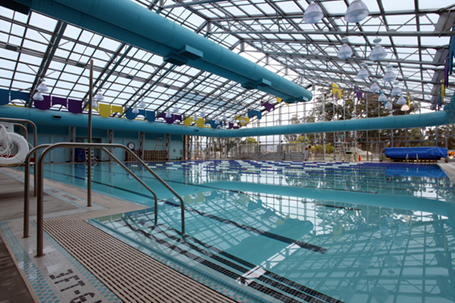 Salinas Aquatic Center achieved the U.S. Green Building Council’s Leadership in Energy and Environmental Design (LEED) Gold rating for energy efficient design.